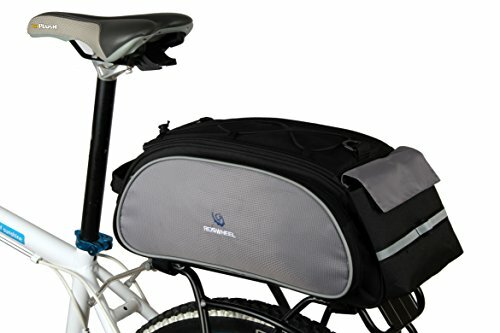 Best Fit For U Roswheel Bicycle Cycling Bike Saddle Rack Seat Cargo Bag Rear Pack Trunk Pannier Handbag Blue Outdoor Traveling New(Black) by SunbowStar at Melon City Bike Club. MPN: BFF-bike-bag-14541-Bk. Hurry! Limited time offer. Offer valid only while supplies last. Integrated PE pad provides great space and anti-crashed. 1 large pocket and three accessory pockets for more free space. With quick-release Velcro for fixation more stable to the bike rack. With reflective loop for safety driving at night. The rubber band at the top for bottle, card or rain cover with the bag. U-shaped pocket cover with zipper for easy organization of items in the main compartment. Suitable for installation on any size of bicycles and organize your little things, such as keys, cell phones, glasses, wallet, etc. Compatible with short riding. The fabric tape on top and shoulder strap for many uses. Max by dimension: approx. 40 x 16 x 21 cm / 15.7 x 6.3 x 8.3 ". Volume: approx. 13l. If you have any questions about this product by SunbowStar, contact us by completing and submitting the form below. If you are looking for a specif part number, please include it with your message.